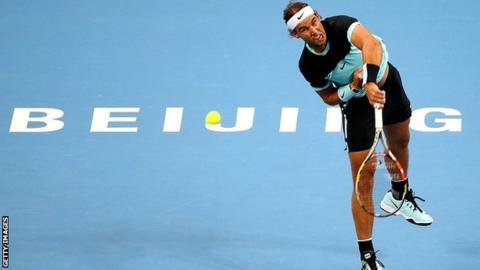 Third seed Rafael Nadal gave a much-improved performance as he beat Canada's Vasek Pospisil in round two of the China Open in Beijing. The Spaniard, 29, won 7-6 (7-3) 6-4 to set up a quarter-final against American Jack Sock on Friday. Second seed Tomas Berdych lost 6-4 6-4 to Pablo Cuevas, while top seed Novak Djokovic plays Ze Zhang on Thursday. "Obviously I improved from yesterday," said Nadal, who lost serve four times against China's Wu Di in round one. "Every victory gives me opportunities to keep practising the things that I need to practise. "Practising outside of the competition is very important, but at the end you have to compete well. Every match is an opportunity for me." In the women's draw, fourth seed Agnieszka Radwanska progressed but eighth seed Caroline Wozniacki lost. The Dane went down 6-2 6-3 to German 10th seed Angelique Kerber. Poland's Radwanska led Madison Keys 6-3 when the American retired with a thigh injury. Spain's Garbine Muguruza, who retired from last week's Wuhan final against Venus Williams with an ankle problem, beat Irina Falconi 6-2 6-1 to move within one win of sealing a place at the WTA Finals later this month. "I knew obviously if I did a great tournament here, I would qualify for the WTA Finals, but I didn't know which round it was," said Muguruza. "I think for sure that's a very good motivation now."